On November 11th, nations around the world observe Remembrance Day in honor of those who have given their lives in combat. In the United States, Veterans Day honors both the living and the dead for their service to our country, marking the achievements of veterans past and those to follow. At LinkedIn, we believe strongly in the potential of America’s veterans to achieve great things after their service concludes, and our Veterans Program works all year to arm veterans and employers with the tools they need to find each other. 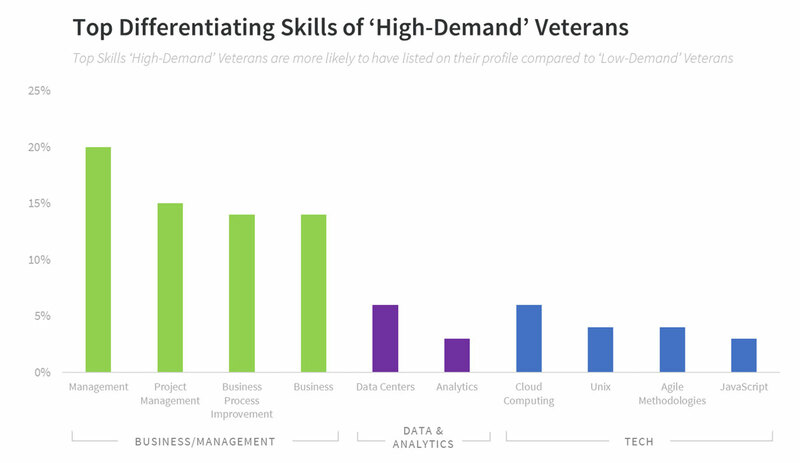 Every year, we look at LinkedIn data on veterans in the workforce and, with competition for recruiting veterans in the United States heating up, this year our analytics team explored the characteristics setting some veterans apart from the crowd. We’re thrilled to see that veteran unemployment rates continue to decrease, as demand for hiring veterans on LinkedIn continues to increase, rising by 3.8% since this time last year. Our team examined the industries, roles, skills, and education levels of the veterans getting the most attention from recruiters. We compared the 25% of our veteran members who are receiving the most InMails from recruiters versus the 25% receiving the least, defining these groups as “high-demand” and “low-demand” veterans. Generally mirroring talent trends across the economy, veterans working in the tech, finance, and health care industries are most likely to be pursued by recruiters. Those working in IT, engineering, or sales functions are all 2x as likely to be considered in this category. As the market for talent gradually shifts away from those with specific degrees and toward those with specific skills, we see tech and management skills rising to the top. This is good news for veterans, as last year we learned that veterans are 5-6x more likely to list certain technical skills than nonveterans, and 2-3x as likely as nonveterans to list certain soft skills that make them great team members and leaders. Education trends generally mirror the above, with veterans who have studied computer science, business administration, and engineering (including electrical engineering, industrial engineering, and mechanical engineering) being highest in-demand. Of particular note, veterans considered “high-demand” are 72% more likely to have completed an MBA than their “low-demand” peers. While the tech, professional services, and financial services industries are most likely to be reaching out to veterans, these industries are also among the top fielding veteran applications. Specifically, veterans are most likely to apply to Information Technology Management and Sales jobs, and to roles in the tech, computer software, and financial services industries in general. One gap of note however – while the Auto/Aerospace industry ranks among the top industries pursuing veterans on LinkedIn, companies in this field have yet to convert that to a corresponding spike in veteran job applications. 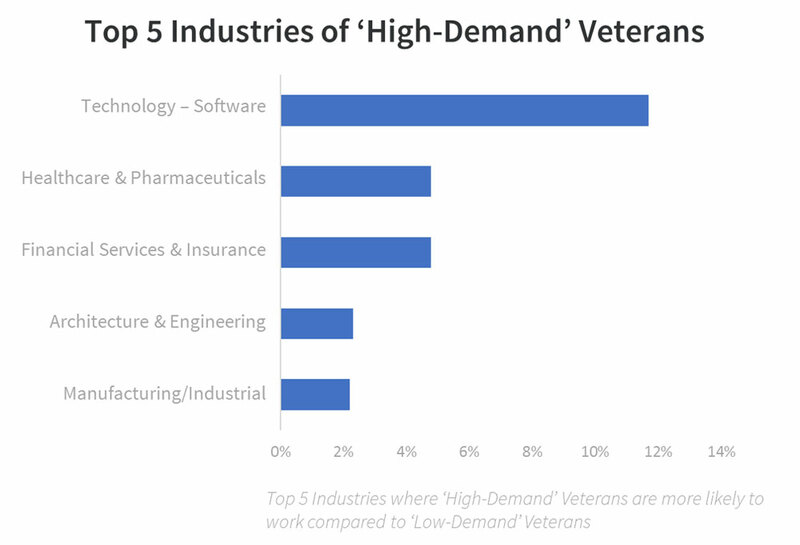 Our data reflects considerable demand for veterans currently working in tech and finance, however we have not tracked these industries’ demand for service members currently in transition. There are a host of tech and finance training programs seeking to create a pipeline from military bases into these industries, and companies would be wise to develop a partnership strategy to tap into this talent pool. 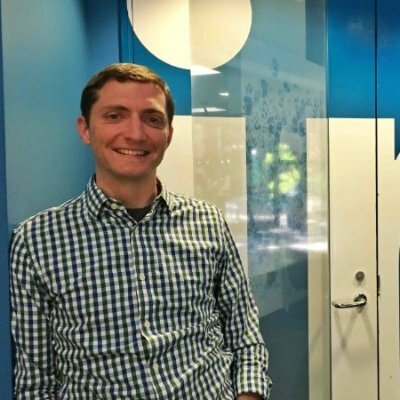 Programs like Microsoft’s Software and Systems Academy, Syracuse University’s Onward to Opportunity program, and Salesforce’s VetForce program are providing on-base and/or virtual training towards tech roles, while BreakLine Education prepares transitioning service members for roles in both tech and finance. Another strong program which is not industry-specific is the Corporate Fellowship run by the U.S. Chamber of Commerce Foundation’s Hiring Our Heroes Program. Through this program, transitioning service members get on-the-job experience with veteran-friendly companies, allowing the company to “try on” veteran talent for size at no cost. Companies can also explore the Veteran Employers School provided by PsychArmor. This database of over 30 free, online courses will help Talent Acquisition and Human Resources professionals learn about military culture, address common misperceptions, and develop effective veteran hiring and onboarding programs. Of particular value is their “15 Things Veterans Want You to Know” course which provides a quick primer in understanding this valuable talent pool. Please also visit the employers portal of our veteran site for more resources to help you build out your veteran talent acquisition strategy. For the purpose of this research LinkedIn analysed aggregated member data of LinkedIn members who identify as ‘US military veterans’, as defined by individuals listing one of the branches of the US military as an employer (US Army, US Navy, United States Air Force,United States Marine Corps, & U.S. Coast Guard, or the associated pages for the various Guard and Reserve branches), or who list a US military school (West Point, Community College of the Air Force, etc.) in the education section of their profile. All analysis has been done on an aggregated level and only for the purpose of this research.